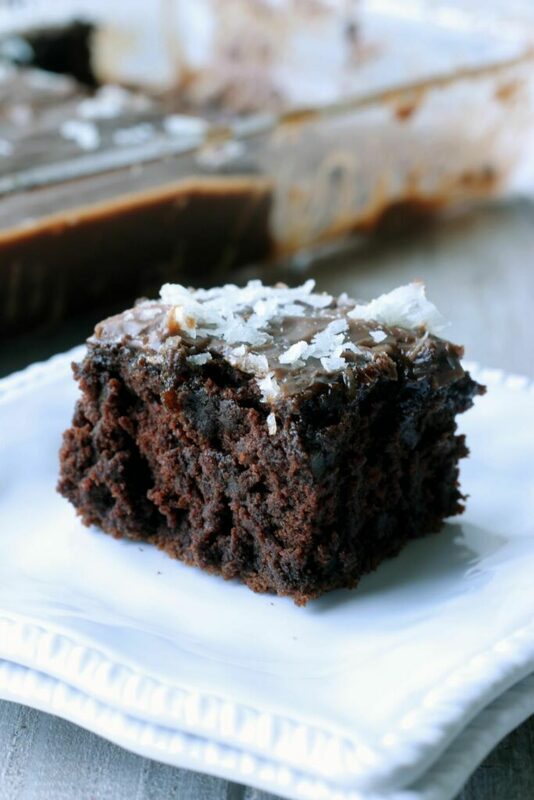 Rich, moist chocolate Texas sheet cake topped with chocolate frosting and shredded coconut. Our tried-and-true, allergy-friendly recipe. This Texas Sheet Cake recipe has been on the horizon for a while, and when I say “a while”, that means since we lived in Texas 10 years ago. Not sure why it took so long to recreate it, but this recipe was worth the wait but right on time for any upcoming birthday parties, baby showers, Summer get-togethers or weekend bbq’s. 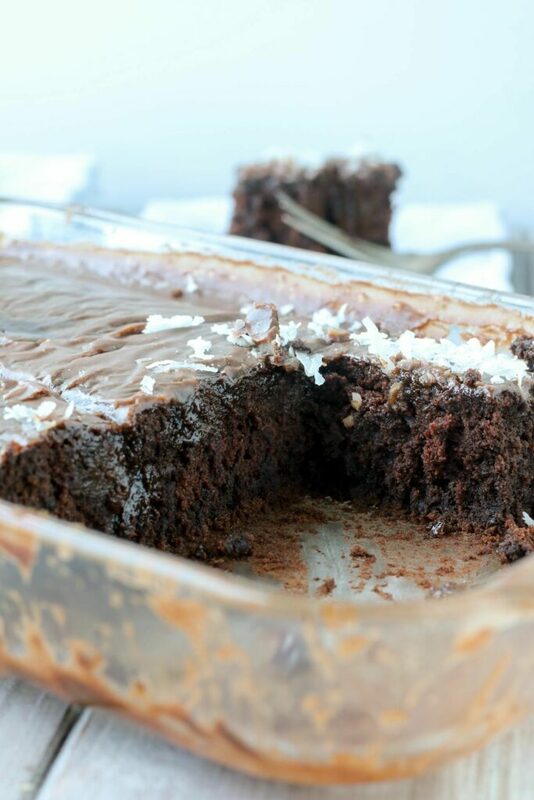 To me, this Texas Sheet Cake is truly one of the BEST top 8 Free cakes I’ve had or made! 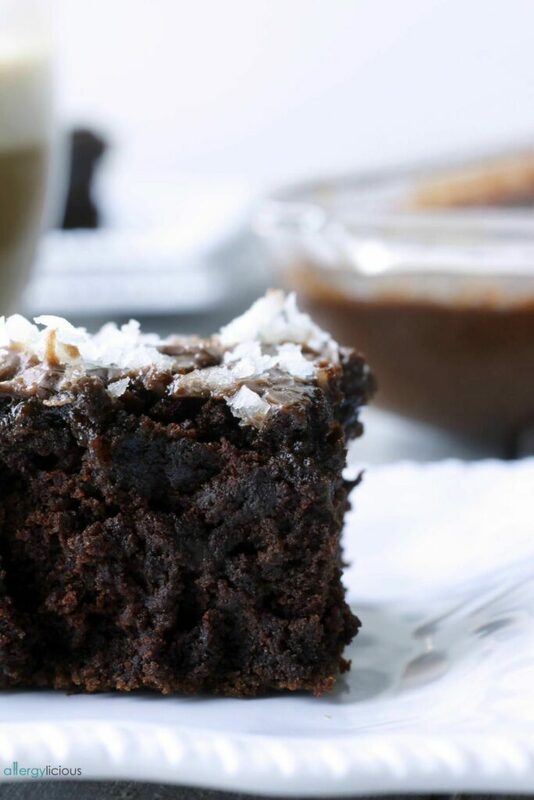 It is moist and melty, rich & chocolatey and will most definitely cause some loud moans from those who take a bite. And there is NOTHING wrong with that because who doesn’t love a little chocolate on chocolate? My version of Texas sheet cake is free from gluten, nuts and it’s vegan because EVERYONE should be able to eat cake! To get serious for a moment, this recipe is a love story to my Texas born son who was diagnosed with multiple food allergies before his 1st birthday. I once thought he’d miss out on cakes & cookies but that’s when I started creating recipes that were safe for him. Because of him, I see dessert differently and instead of thinking about what he CAN’T have, I see what he CAN have. I want that for you to! The ingredients are easy to find and substitute BUT the one thing you can’t leave out is the star of the show….. fruity soda! Yep my friends, soda. Can I get a “yee-haw“? 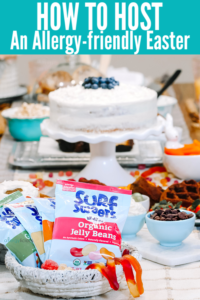 Fruity soda makes this Texas sheet cake & frosting amazing & cause your taste buds to do a little dance in your mouth. Keep it healthier & choose Dr. Zevia which is GF, Vegan & free from all the yucky sugars. If you’re like “It’s cake and I’m using the real stuff“, then go for it and pop open a can of Dr. Pepper or Cherry Coke. Then get your forks ready! Once this cake comes out of the oven, you’ll be pouring the warm fudgy frosting all over this decadent Texas sheet cake and be digging in! IF you let it sit a minute, the frosting will start to crackle and that short wait is worth it, but not all of us have been given the virtue of patience! Warm chocolate cake, drenched in a rich, chocolaty fudgy frosting for an amazing allergy-friendly twist on classic Texas Sheet Cake. Preheat oven to 350°. Lightly spray 17×12″ sheet pan. In a medium saucepan, bring first 3 ingredients to a medium boil, stirring often. Then remove from heat. Whisk flour, sugars, baking soda & salt together in a large bowl. Add warm mixture and whisk until blended. Whisk in “buttermilk”, eggs & vanilla. Pour batter into prepared sheet pan. Bake for 22-25 minutes or until wooden pick inserted into center comes out clean. In a medium saucepan, melt butter & chocolate chips, whisking often until smooth. Remove from heat & whisk in milk and soda. Gradually sift in powder sugar and vanilla until smooth. Poor immediately over warm cake. 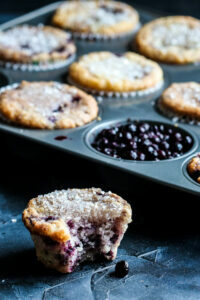 When using gluten-free flour, cake could take a little longer to bake so keep an eye on it. 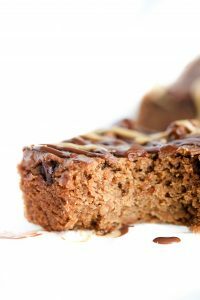 If you’re craving more chocolate recipes while you’re waiting for your Texas sheet cake to bake, here are a few more of my favorite recipes posted so far: German Chocolate Cake , Chocolate Zucchini Muffins, Double Chocolate Pancakes or The BEST Allergy-friendly Chocolate Chip Cookie Dough Cup. If you like this recipe & want to see more like this, simply subscribe to Allergylicious in the side box and you’ll get every new recipe directly to your inbox! You can also download my ebook called Eat Dessert First which puts our favorite recipes right at your fingertips, wherever you go. It’s hard to believe that delicious looking cake is gluten free and vegan, but psyched it is. I want to lick the spoon! I LOVE Dr. Pepper! Do you know David Crowder lives in the house originally owned by “the” Dr. Pepper?! Really? I didn’t know that, so cool. You know, I’m not a cake fan, but I love fudgy goodies like brownies and blondies. This might be my cake! It looks amazing. If and when 😉 you decide to try it, please let me know. I think you may just find a cake you really like. Oh it is Crystal! Fudge & chocolate galore. Right? The pop makes it extra soft & adds that little spice. And I LOVE that you call it pop btw! Since I moved to the states, it’s hard to find others that call it that.